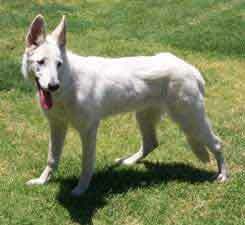 Kori is a purebred white German Shepherd Dog who we guesstimate to be between 6 and 10 months old. She was picked up by animal control wearing a collar and an ID tag; however, when the phone number on the tag was called, it had been disconnected. A letter was sent to the address listed for the phone number, but there was no response. Of course, the irony of this is that when a dog is impounded that has ID (which indicates an owner), the shelters are REQUIRED to hold them for a week. Strays are only required to be held for 72 hours. 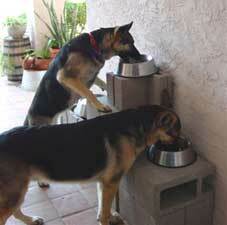 This gives the dogs a longer period of time to be exposed to infectious diseases which are prevalent in all shelters. So, Kori spent her week waiting and waiting for her owners to come and claim her. They never did. On the day that Kori could have been put up for adoption, it was noticed that she was getting the ever present and always anticipated URI (upper respiratory infection) that seems to insideously infect all dogs that spend even a short amount of time in the shelters. Kori could not be offered for adoption and was scheduled to be put down if she was not picked up by 6 p.m. A quick call to the shelter by our rescue, and Kori was given a "stay of execution" until the following day. A HUGE thanks goes out to Barbara, who was kind enough to transport Kori from the east side for us. Our initial impression of Kori is -- this is one happy little girl. Her tail is always wagging. She is loving and sweet, inquisitive and mischevous, and all the things a GSD puppy should be! She appears to be crate trained, as she has been going into a crate for cat naps all afternoon. She also seems perfectly comfortable in the house. Her housetraining and manners will be assessed during the coming week, although we already have discovered she knows "sit" and walks on a leash without pulling. We anticipate that she's going to be one sick little girl once the URI takes hold. She's already started on antibiotics and will be spayed, microchipped and updated on shots once she's healthy. She also needs to put some weight on these bones of hers, but I can't blame her for not eating in the shelter. She's otherwise clean, well behaved and has been well taken care of. One can only hope that she was given the appropriate puppy shots. . . time will tell. A commitment to training is definitely in the cards for the adopter of this precious gem. 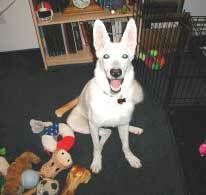 UPDATE 6/5: Kori has a good handle on housetraining and is also crate trained. 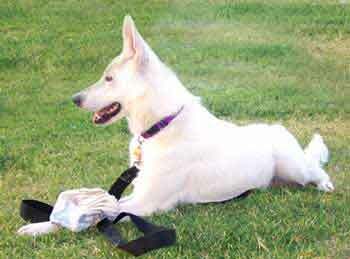 She is filled with puppy curiosity and loves to play tug-o-war and chew on her pressed rawhide bone. All in all, this is one teriffic puppy. The antibiotics will be completed the week of the 14th, after which she'll see the vet for a checkup and bloodwork and we'll determine a course of action for updating her on her shots and spaying, which we anticipate will be scheduled for approximately June 30th. 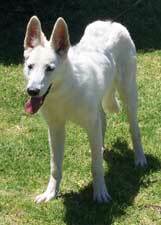 After an appropriate recovery time (a week to 10 days), she will be ready to begin the search for her forever home. UPDATE 6/14: Kori kept her appointment with the vet today. She went in wagging her tail and met lots of new friends. Best guess as to her age -- 6 to 8 months. The vet said she was thin, but otherwise appeared healthy. He's going to wait for the bloodwork results to make any recommendations other than to try and fatten this little girl up! Kori has had a minor setback. She's been vomiting today and unable to keep any food down. The vet advised to withhold all food and water and, after an hour, administer Pepto Bismol. If she keeps that down, give another dose of Pepto Bismol and the usual doctor's advice - "Call me in the morning." After a successful night, we called the vet this morning (6/16) and were advised to begin feeding Kori very small meals of boiled hamburger and rice. UPDATE 6/16: So far, Kori has managed to keep all of her meals down. Some of the results of the bloodwork are in. She is NEGATIVE for tick fever and NEGATIVE for valley fever. She does have an elevated white count, so we're waiting for the vet to interpret that and the rest of her bloodwork readings. Finally spoke to the vet (6/17). Kori's bloodwork is normal, except for the elevated white count, which is what we always anticipate for any dog coming out of a shelter. The vet put her on daily injections of penicillin and we're continuing the hamburger and rice (much to Kori's delight). UPDATE 6/19: Kori is improving steadily and was moved to a new temporary foster home today -- it was love at first sight for all concerned. She didn't bat an eye as she checked out her new digs and settled right in -- LET THE GAMES BEGIN! We're hoping to get her completely well and fattened up for her spay appointment at the end of the month (or early July). She's moving back slowly to normal puppy food in favor of the hamburger and rice and seems to be putting on some much needed weight. She'll be starting her regimen of amoxicillin on Monday, which the vet feels is finally the right medication to rid her of this upper respiratory infection that has been hanging on for 3 weeks now. UPDATE 6/27: KORI NEEDS AN ANGEL. Kori is still having trouble holding down her food, and the vet wants to do some testing to find out what is causing the problems for our little girl. Hopefully, this will lead to a resolution of her problem and not require surgery. She is otherwise a happy, sweet and adorable baby, and we are committed to getting her healthy. 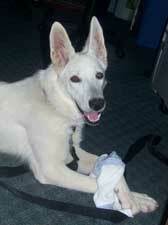 Kori will not be available for adoption until we resolve her medical issues and she is spayed. Her adoption fee will be determined at that time. Please check this web page for all updates on our little sweetheart. UPDATE 7/01: Kori is back with her original foster mom and saw the vet today. We have scheduled extensive diagnostic testing for Monday and we hope to have a definitive diagnosis by Tuesday. UPDATE 7/05: Thanks to the kindness, generosity and caring of Kori's ANGELS, we were able to quickly do the diagnostic imaging we knew we would have to do in order to confirm or rule out what we've suspected all along. 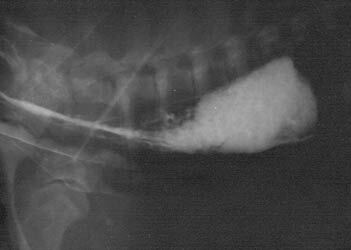 After a series of barium x-ray studies today, it is plain to see that our Kori has a severe case of congenital Megaesophagus. It has been suggested that we humanely euthanize Kori. 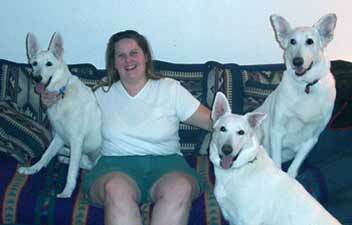 Out of deference to both Kori and her band of Angels, we have opted to wait a week before making any decisions. We are hoping that there is someone out there who can commit to Kori's care -- we think she's worth it. 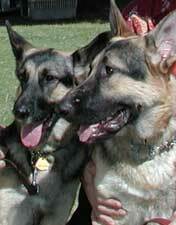 We personally know of two "Mega GSDs" who are thriving beautifully. Both have the congenital form of Mega. We have chosen not to go into lengthy detail on the intricacies of Mega here. Rather, we strongly encourage you, if you are considering taking on Kori's care, to take advantage of the, literally, thousands of articles and personal histories available on the internet and thoroughly investigate the information available on this condition. 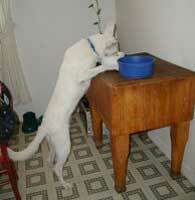 Then, if you feel you can stick to the not-so-demanding feeding regimen required, please let us know. Yes, there is always the chance of aspiration with megaesophagus; however, don't tell that to a friend with the beautiful 3 year old. Mega CAN be managed, yet there are no guarantees. Were our Kori not the sweetest little girl, we might have gone in a different direction. 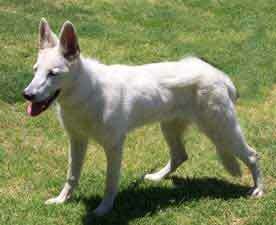 But this absolutely lovely creature has a lust for life that she is ready to share with someone VERY special. 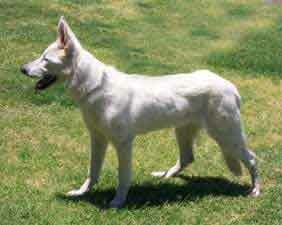 In the event you are considering committing to Kori and would like to speak with the Mom of a Mega GSD, let us know. She can tell you exactly how easy (or difficult) it is. We placed "Courage" (formerly Harley) last year, with a family who owns a Mega female. 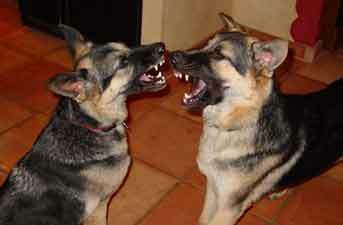 They are both vibrant, healthy active dogs who are crazy about one another. Is Kori for you? We guarantee she is worth the effort and will return your love and commitment a thousand fold. UPDATE 7/13: Kori continues to do well and is adjusting to having to reach up to eat. We are raising her food bowl a little higher each day, and she seems to be keeping more and more food down now that we have discovered the proper way this baby needs to be fed. As always, she continues her bright disposition and is unaware that she has any problems. The vet has pronounced her fit to undergo surgery, so we are going to schedule her spay for this week. Look at all the toys I got!!!! Kori's adoption is final. Thank you to new Mom Sara, Ohso (one of our former rescue kids) and Qapa for their commitment to our special needs girl. Thanks also to all who cared about this sweet angel. Her care will be lifelong, and your thoughts and prayers for her continued health are appreciated. Kori on August 16th. She's growing fast under Sara's loving care. 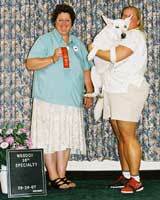 Here s Kori, more than 2 years later competing at the White German Shepherd Dog Club's national specialty show!! 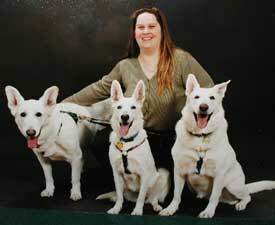 UPDATE FEBRUARY 2012: Kori passed away in her sleep at almost 9 years of age. She was very much loved and will be missed by her forever family.